Rob Carson was one of many journalists who covered the eruption of Mount St. Helen's in 1980. He continued writing about Mount St. Helen's as a special projects reporter for the Tacoma News Tribune, so much so that he eventually earned the nickname 'The Volcano Guy'. In 1990, Carson wrote Mount St. Helens: The Eruption and Recovery of a Volcano to mark the 10th anniversary of the eruption. The essays in his book outline the events leading up to and following the eruption and are accompanied by incredible photos. 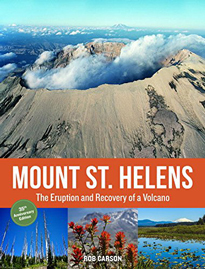 Carson's book was republished in 2015 with new photos and an added chapter on the mountain's recovery and the vast advances in volcano research since 1980.